Gamification allows brands engage with their audience in a fun, exciting way, using traditional game mechanics in an online environment. It encourages quality engagement, awareness and is proven to solidify retention and brand loyalty. It can even educate a brand's audience. So why is gamification such a hot topic right now and why should brands invest time and effort in building it into their content marketing strategy? Well, the exponential growth in smartphones means that billions of users have an advertising screen in their hands. The trick for brands in grabbing their audience’s attention in our ‘Attention Economy’ is to rise above the competing noise on social media. This is where good gamification techniques come in. Excite your audience, make the game fun, give away a prize, encourage social sharing and bragging rights…everyone wants to top that Leader-board…right? By creating a cool, fun digital experience for your audience you will not only engage them but will create a positive halo affect around your brand. Gamification is highly effective not just with a brand’s external audience but also internally, by gamifying their HR. Gamification fits right in if you are trying to put your employees at the centre of the HR process. It increases employee participation, education, involvement and staff retention. Don’t take my word for it though!...yukaichou.com recently published a list of 90+ gamification cases (see the full list here) with ROI stats from some of the biggest companies on the planet who have successfully used gamification to change their business. Dominoes Pizza created the gaming app Pizza Hero and increased sales revenue by 30% by letting customers create their own pizza with an app. Google designed a Travel Expense System resulting in almost 100% employee compliance. AstraZeneca gamified medicine training with a 99% completion rate. Verizon users spend over 30% more time on-site with social login games versus a regular site login. Moosejaw clothing company saw 76% of sales revenue come from gamified activities resulting in a 560% ROI from initial marketing activities. 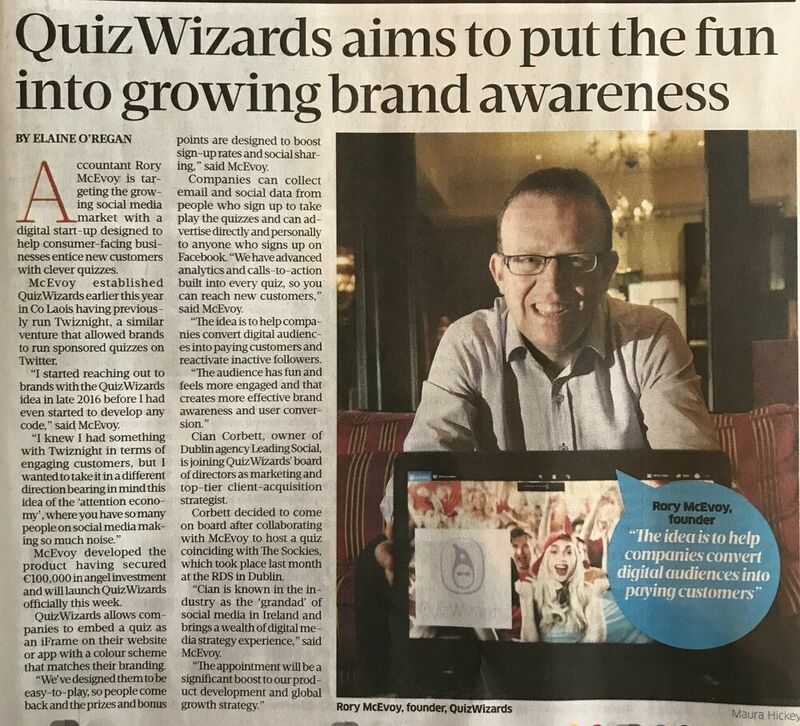 I have 5 years of brand – customer gamification experience starting with my original award winning quiz company; Twiznight – The Twitter quiz, which created huge engagement and reach for sponsoring brands. This proved there was a huge appetite for this type of quiz product. Acquired in 2017, I then went on to develop the magical QuizWizards! QuizWizards takes the pain out of content creation by providing a fun digital experience for a brand’s audience in the form of a fast, exciting, prize laden quiz. We create tailor-made quizzes right on a brand’s website, helping them cut through the social media clutter, gamifying their audience and capturing valuable data from 1,000's of potential buyers, GDPR friendly of course. In a recent quiz for Joe.ie, over 5,000 users took part in their 1990’s Movie Quiz in the first 4 days. Try it for yourself here and see if you can top the leader-board! To speak to us about getting a branded demo contact sales@quizwizards.com or speak to Rory directly on +353 87 9703299.